Aluminium alloys exhibit some outstanding properties which make them to be widely used in many applications. This study examined the effect of particles of ZnO and graphite on mechanical and wear characteristics of Al-Si alloy hybrid composites developed by stir casting method for automotive application. Zinc oxide and graphite particles were thoroughly mixed in varied weight fractions (11, 14, and 17 wt. %) with Al-Si alloy. The hybrid composite exhibited the highest hardness and tensile strength values of 113.67 VHN and 163.67 MPa respectively at 14 wt. % particles addition. The volume loss during wear increased with speed and load but was marginal in the reinforced samples. The microstructure showed good dispersion of particles of ZnO and graphite in the Al-Si alloy. The mechanical and wear characteristics of the composites were enhanced by the uniform distribution of the ZnO and graphite particles in the Al-Si alloy matrix and the strong adhesion of alloy-particles phases. 1. Baradeswaran A and Perumal AE. Study on mechanical and wear properties of Al 7075/Al2O3/graphite. Elsevier Composites Part B, 2014;56:464–471. 2. Ravindran P, Manisekar K, and Narayanasamy R. Tribological behaviour of powder metallurgy-processed aluminium hybrid composites with the addition of graphite solid lubricant. Ceram. Int., 2013;39:1169-1182. 3. Kang YC and Chan SL. Tensile properties of nanometric Al2O3 particulate-reinforced aluminum matrix composites. Mater. Chem. Phys., 2004;85:438–443. 4. Sherif M and Eskandarany E. Mechanical solid state mixing for synthesizing of SiC/Al nanocomposites. J. Alloys Compd., 1998;279:263-271. 5. Valiev RZ, Islamgaliev RK, and Alexandrov IV. Bulk nanostructured materials from severe plastic deformation. Prog. Mater. Sci., 2000;45:103-189. 6. El-Labban HF, Abdelaziz M, and Mahmoud ER. Preparation and characterization of squeeze cast Al–Si piston alloy reinforced by Ni and nano-Al2O3 particles. Elsevier, Journal of King Saud University-Engineering Sciences, 2016;28:230-239. 7. Rufai OI, Lawal GI, Bolasodun BO, Durowaye SI, and Etoh JO. Effect of cow bone and groundnut shell reinforced in epoxy resin on the mechanical properties and microstructure of the composites. World Academy of Science, Engineering and Technology (WASET), International Journal of Chemical, Molecular, Nuclear, Materials and Metallurgical Engineering, 2015;9:353-359. 8. Mechtali FZ, Essabir H, Nekhlaoui S, and Bensalah MO. Mechanical and thermal properties of polypropylene reinforced with almond shells particles. Impact of Chemical Treatments. Journal of Bionic Engineering, 2015;12:483-494. ISNAD Durowaye, Stephen , Sekunowo, Olatunde , Lawal, Ganiyu , Orji, James . "EFFECTS OF ZnO AND GRAPHITE PARTICULATES ON MECHANICAL AND WEAR CHARACTERISTICS OF Al-Si ALLOY HYBRID COMPOSITES". 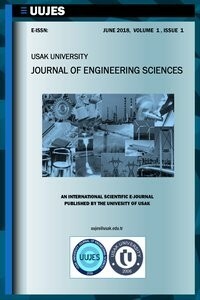 Usak University Journal of Engineering Sciences 1 / 1 (June 2018): 19-27.